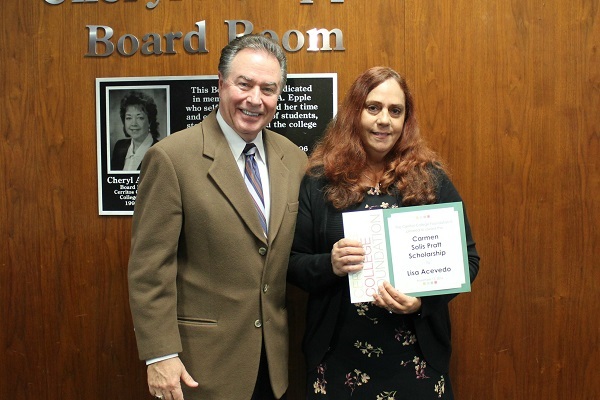 NORWALK, Calif. – December 8, 2016 – The Cerritos College Foundation recently presented Lisa Acevedo of Anaheim with the $1,800 Carmen Solis Pratt Scholarship. Retired Norwalk Superior Court Judge Dan Pratt established the Carmen Solis Pratt Re-Entry Scholarship in 2001 in memory of his mother who valued education, but was never able to attend college herself. Each year, a recipient is selected among applicants who are re-entry students at Cerritos College and are 35 years of age or older. This year’s recipient is a re-entry student currently seeking admission into the nursing program at Cerritos College, and will be earning her associate’s degree next year. Having overcome many challenges in life, Acevedo is focused and determined to succeed. She served eight years in the U.S. Navy where she became a licensed vocational nurse. She loves her work and is excited about transferring to California State University, Long Beach to earn her bachelor’s degree in nursing, and becoming a registered nurse. About the Cerritos College Foundation: The Cerritos College Foundation, a non-profit organization, serves as a charitable vehicle for the community, individuals and alumni, to assist with financial support of Cerritos College. Visit the Foundation online at www.cerritoscf.org.